Today I am playing along with the Pootles Colour Challenge #PCC012 & I absolutely love this colour combo! Tip Top Taupe, Mint Macaron & Flirty Flamingo - three of my fave colours separately but I hadn't thought to match them up & I think they look stunning! I've been trying to figure out what I can make for my brother's request of two engagement cards & I am so happy with these, I think they fit the bill really well. I hope you & the recipients love them, too! I have used a Tip Top Taupe cardstock base. I have cut these as A Frame cards for a change. I have then added a layer of the Silver Glimmer cardstock & I have also used this for the largest flower in the arrangement on the front. The coloured layer is the Irresistibly Floral Specialty Designer Series Paper. In the pic above, I have sponged this with Mint Macaron & in the one below, I have sponged it with Flirty Flamingo. I have then Silver heat embossed (with Versamark & the Heat Tool) the flowers from the Falling Flowers stamp set & die cut them on the Big Shot with the matching May Flowers framelits. TIP: I have used my Precision Plate for the big Silver Glimmer one at the back & I find I get a cleaner cut if I face the Glimmer paper down onto the the Precision Plate with the framelit facing down on the back. I have done the flowers on Whisper White cardstock & then used the Mint Macaron & Flirty Flamingo to sponge over the top. I stapled the silver flower with two of the sponged ones to the DSP & then stuck the smaller flower over the top with a Dimensional. I also stapled the DSP to the Silver Glimmer paper as I find that glue doesn't stick too well to it. 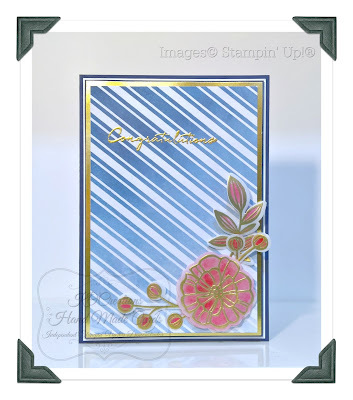 I have also added Dimensionals between the Silver Glimmer paper & Tip Top Taupe layers. I have stamped the sentiment from the For the New Two stamp set in Archival Black. I actually tried to do it in silver heat emboss, but I found the powder stuck to all the lines on the paper, so I brushed it all off & stamped black over the top. And lastly a shot of the inside. Both cards are the same on the inside. As well as being inspired by the colours from the Pootles Colour Challenge, I was also inspired by Kim Oliver's lovely card below. OMG Jessie your card is gorgeous...I love the soft colours, the layering and the bit of bling with the glimmer paper!